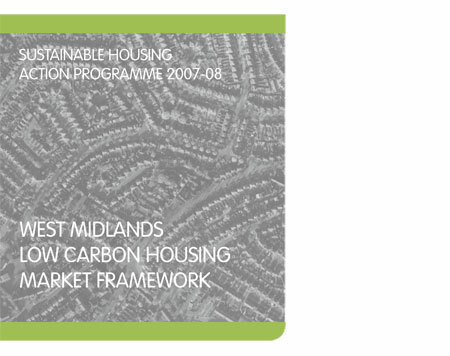 The Sustainable Housing Action Programme (SHAP) is the regional low carbon housing programme for the West Midlands region, managed by Sustainability West Midlands on behalf of regional partners, which include Advantage West Midlands, the West Midlands Regional Assembly and West Midlands Constructing Excellence. SHAP has funding for 2007-08 from the Energy Saving Trust and Science City West Midlands to research the lessons from leading examples of low and zero carbon housing developments that have been completed in the UK – with a focus on new-build and refurbishment, and the cost, values and drivers - and the support that may be needed in the West Midlands region to support the housing market. New-build housing: The need to support the housebuilding industry as it moves towards compliance with the new Code for Sustainable Homes, and as Regional and Local Government moves towards a stronger focus on planning for low carbon development in response to the new supplement to PPS1 on Planning and Climate Change and the draft RSS Revision. Existing housing stock: The need to raise the standard of the existing housing stock in order to deliver domestic emissions reductions in line with the Regional Climate Change Action Plan, regional and local climate change strategies. The second part of the report presents the findings of action research to explore the lessons from over 20 case studies of low and zero carbon housing, and engagement with stakeholders in the public and private sectors involved in housebuilding, management and maintenance. The aim of this second report is to explore the issues arising from new standards such as the Code for Sustainable Homes and Energy Performance Certificates, as well as the need to improve the existing housing stock, and to identify solutions that have been adopted to date.